The Icarus Syndrome uses the Greek myth of Icarus to illustrate American foreign policy shortcomings following World War I, Vietnam, and Iraq. In the myth of Icarus, a father and son are trapped on an island, and the father builds the son wings made of feathers and wax. He cautions the son not to fly too high or too low, but rather to stay in the middle range. At first, Icarus is cautious and heeds his father’s advice, but as his confidence grows, he gradually flies higher and higher until people from below believe him to be a God. Soon, his judgment suffers as confidence turns to hubris, and he flies too close to the sun. As a result, Icarus’ wings melt, and he falls to his death into the sea. Beinart organizes his book into three parts: The Hubris of Reason, The Hubris of Toughness, and The Hubris of Dominance. The downfall of American foreign policy in each instance, according to Beinart, was taking ideas that were successful in limited circumstances, and attempting to expand them into grand doctrines that could be applied everywhere. In the book, Beinart asserts that Woodrow Wilson and the progressives believed that the righteousness of American ideals could, in and of themselves, change the dangerous world in which the country now involved itself. He suggests that Lyndon Johnson and the Camelot intellectuals were in love with force and the exercise of power. Finally, he describes a George W. Bush and his conservative camp as people who believed that America could dominate all regions and felt an obligation to democratize other cultures, whether they wanted democracy or not. In the process, all three administrations failed to understand a very simple and basic fact: The people who lived in these other regions of the world were not like Americans. Throughout, Beinart makes complicated information easily understandable with excellent writing and allegorical storytelling. Examples of titles of chapters of his book include “The Frightening Dwarf,” “The Murder of Sheep,” and “Fighting with Rabbits.” Stories lead into major concepts and build his arguments as they are supplemented with historical facts. In this way, the theory of containment, the powers of the presidency, and other important concepts, as well as the personality of the players themselves, are described in interesting and enjoyable ways. The myth of Icarus is the perfect analogy for Beinart’s premise. This book is an outstanding read not only for the importance of the information contained in it, but also because of his enjoyable style of writing. 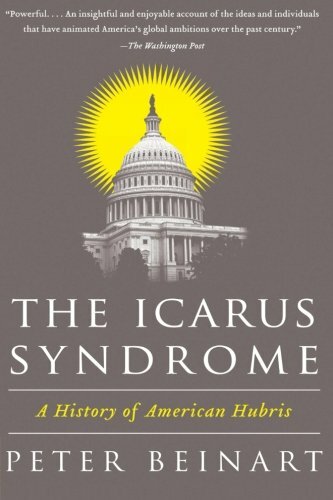 The Icarus Syndrome ranks alongside other monumental efforts such as The Best and the Brightest by David Halberstam and The World Is Flat by Thomas Friedman. Come fall, high school U.S. History teachers should throw out their textbooks and assign The Icarus Syndrome instead.